Sometimes I crave foods other than chocolate. I know, hard to believe! But true. During the winter I’m usually all about comfort foods. Anything that will make my insides feel warm and cozy, like stew, mashed potatoes, mac & cheese and … uh oh, I’m getting hungry! But now that we’re approaching March, I’m getting tired of the cold and I’m craving something more summery. Something light and refreshing. I should start by saying that I know absolutely nothing about Greek food. My mom’s side of the family is all Italian and since she did most of the cooking growing up, it’s the cuisine that I’m most familiar with. I don’t think I was ever even exposed to Greek food until I got to college. A few years ago I discovered the deliciousness that is tzatziki (pronounced dza-DZEE-kee) and I’ve been obsessed ever since. 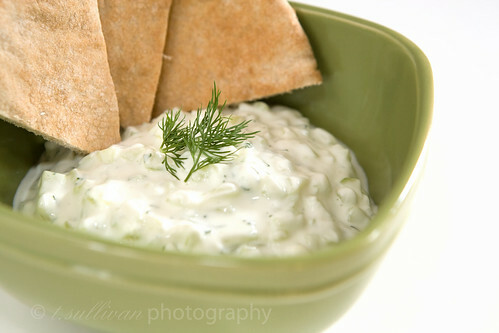 If you’ve ever had a gyro, chances are you’ve tasted tzatziki before. This batch was super easy to make at home using the recipe below and is just as good as the store bought kinds I’ve had, if not better. 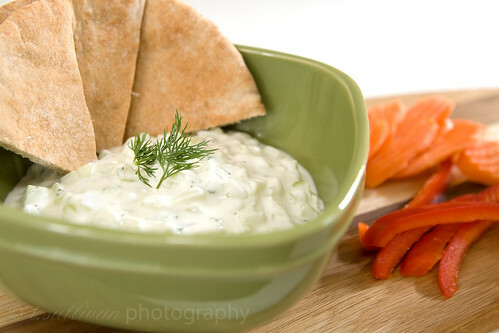 I like to eat tzatziki like a dip with pita bread, carrots, red pepper strips, or sometimes just a spoon (it’s that good!). Peel cucumbers, then cut in half lengthwise and take a small spoon and scrape out seeds. Discard seeds. Dice cucumbers, then put in a colander, sprinkle on 1 T kosher salt and let stand for 30 minutes to draw out water. Drain and wipe dry with paper towel.